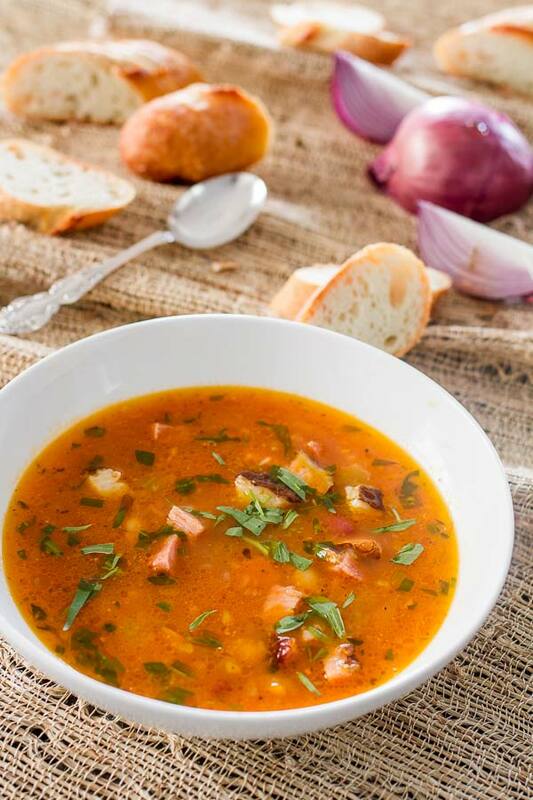 I realized, only few days ago, that I don’t actually have bean soup on my blog, one of the most cooked Romanian recipes… ever! I had so much bean soup in my childhood that, by the time I moved to Canada, I never wanted to see it again… until now. It’s funny how given enough time, you start missing all those weird things that you could not take when you were young…er. Anyway, I am exaggerating a bit, I always liked bean soup, my mother used to make a pretty good one and she’s still doing it now in her 80s. After getting all the information I could regarding the recipe, I went to work. Few days ago I bought a big chunk of smoked hickory ham, in the hope that we (wife and I) will get some recipes ready, in time for Christmas, for our blogs. I must tell you, I never had this before, Romanian ham is a bit different and usually it is fresh/frozen and not pre-cooked like the one we got but I figured, what the heck, cannot be that bad. Well it wasn’t, as a matter of fact, after using all the spices and glazing that came with the package, it was awesome and I stuffed myself like a… hungry person. After eating a big chunk of the thing and NOT cooking anything worth blogging about, I decided to use some of the leftovers in a bean soup. The result was delicious, but it usually is anyway though my cooking skills are dubious to say the least (weird). If you want to make your life easier (no chopping skills here), you should get this KitchenAid Food Chopper , it was by far my most smart investment in the kitchen. Other than that, recipe is a walk in the park and I hope you guys enjoy it. Melt butter in a large stock pot over medium high heat. Add the onion and saute until translucent then add celery, carrots and garlic and saute for another 5 minutes. Fill the pot with 2.8 qt (3 L) of water and then add ham, parsnip, bay leaves and Vegeta. Bring to a boil and lower heat to medium. Let cook for about 30 minutes. Add rinsed beans, thyme, tomato paste and season with salt and pepper. Continue cooking for another 30 minutes. Remove bay leaves and parsnip. Remove from heat and add tarragon; cover with lid and let sit for 5-10 minutes then serve. Very good recipe! My Romanian husband loved it and so did I. Yummy indeed. Next I will try your tripe soup. Thank you very much! It is always a pleasure to find out what people think about my recipes.